Tellus Studio combines key features of the Tellus Toolkit into a single application that provides the world construction, mission planning, models database and physics modeling features needed to construct simulation based vignettes in real-time. This includes scenario reconstruction, conceptual mission development and teaming missions. 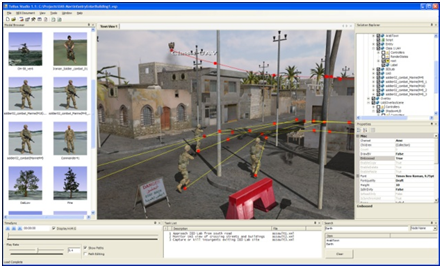 Physics, sensors, characters, vehicles and airspace can be combined with the simulation environment to rapidly produce a 4D representation of any scenario imaginable. A standard database of soldiers and civilian characters, UAVs, Military Aircraft, etc. are provided with drag drop integration into the scenarios with artificial intelligence based behaviors to automate the production processes.